As key links in transportation and supply chains, the effect of climate change on seaports has broad implications for the development prospects of the global economy. However, the picture is very uncertain because the impacts of climate change will be felt very differently around the world, both positively and negatively. This book addresses the need for quality theoretical analysis, highly innovative assessment methodologies, and insightful empirical global experiences so as to identify the best international practices, planning and appropriate policies to effectively adapt to, develop resilience, and indeed benefit from, the impacts posed by climate change on transportation and supply chains. 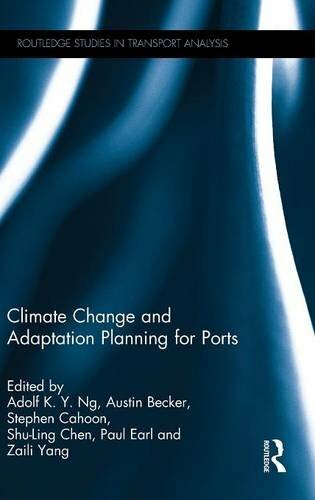 This book comprises of theories, methodologies and case studies from five continents (Asia, Europe, Latin America, North America, and Oceania) addressing climate change and the adaptation planning of ports and transportation infrastructures. With reputable contributors from academic, policymaking and professional sectors, it critically analyses the recent attempts by ports in establishing adaptation plans and strategies so to enhance ports and other transportation infrastructuresÃ¢ÂÂ resilience to the climate change risks. This is the first book of its kind to focus on climate change adaptation for ports. It offers useful and comprehensive guidance to senior policymakers, industrial practitioners and researchers who are eager to understand the dynamics between climate change, adaptation planning of ports and transportation infrastructures. About: As key links in transportation and supply chains, the effect of climate change on seaports has broad implications for the development prospects of the global economy.